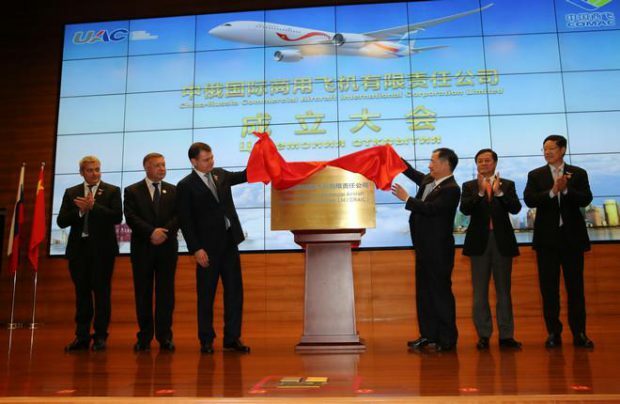 Russia’s United Aircraft Corporation (UAC) and Commercial Aircraft Corporation of China (COMAC) have reached another milestone in the joint program to develop a new-generation long-haul widebody aircraft, codenamed C929. On May 22, the partners opened the Shanghai office of their joint venture (JV) that will manage the project. The JV, known as China-Russia Commercial Aircraft International Corporation (CRAIC), received its operating license on the same day. “The establishment of the JV is an important practical step signifying the partners’ commitment to long-term cooperation and to ensuring the program’s success,” UAC President Yury Slyusar said at the opening ceremony. “Together with our colleagues at СОМАС we created the organization that will be in charge of the production, sales, and after-sales support of the new airliner; it will also be engaged inmarketing and business planning activities.” The JV agreement was sealed during Russian President Vladimir Putin’s official visit to Beijing in June 2016. The JV and the entire project are 50/50 owned by the partners. Vladislav Masalov, UAV vice-president for civil aviation and president of Sukhoi Civil Aircraft Company, has been appointed as chairman of the new enterprise’s board. SCAC will be used as the basis for creating CRAIC’s civil aviation arm. COMAC CEO Guo Bozhi has been appointed as CRAIC general director. He also leads the widebody long-haul program at COMAC. The board of directos will comprise eight members, four from each side; these were appointed at the board’s first meeting on May 22. Masalov told Russian Aviation Insider that the establishment of the JV has paved the way for launching design work on the future aircraft, and that a joint engineering center will be set up in Moscow for the purpose. UAC will be responsible for designing the wing, high-lift devices, engine pylons, and main landing gear struts. COMAC will develop the fuselage, empennage, nose landing gear strut, nose cone, and wing-fuselage fairings. “Our agreement calls for UAC to act as the project integrator,” Masalov said. Part of the design work may be outsourced to other Chinese and Russian companies. Masalov added that the preliminary design review is expected to take place in late 2018. The baseline version for 280 passengers and with a range of 12,000 km will be developed first. The partners are also planning to developed a 230-passenger shortened version and a 320-seat stretch. According to Slyusar, the partners have already been in contact with Chinese carriers and lessors potentially interested in the C929, for which China is viewed as the primary market. Potential customers are primarily interested in the future airliner’s cost-efficiency. The developers are planning to achieve this with using composites across the airframe, including in the wing, and also by introducing electric systems and new aerodynamic solutions. The partners are to have identified their project suppliers by year-end. Requests for information have already been sent to a number of companies. Potential Chinese operators would like to have a choice of two powerplants. The developers are mulling GE Aviation and Rolls-Royce as their engine suppliers. Masalov said Russia’s Aviadvigatel PD-35 new-generation turbofan might also be offered as an option. The final assembly line will be set up in Shanghai. According to Masalov, there is as yet no final agreement on who of the partners will supply which components. Masalov said the partners assess the global widebody market at 7,000 airframes between 2023 and 2045, with the highest demand in the Asia-Pacific Region, China, Russia, and other CIS countries. C929 deliveries are expected to begin in 2027.